I have worked a lot on this since last, but it has gone a little slow since I have a lot of other stuff too do too, but I have gotten the body done, and have started on the head. 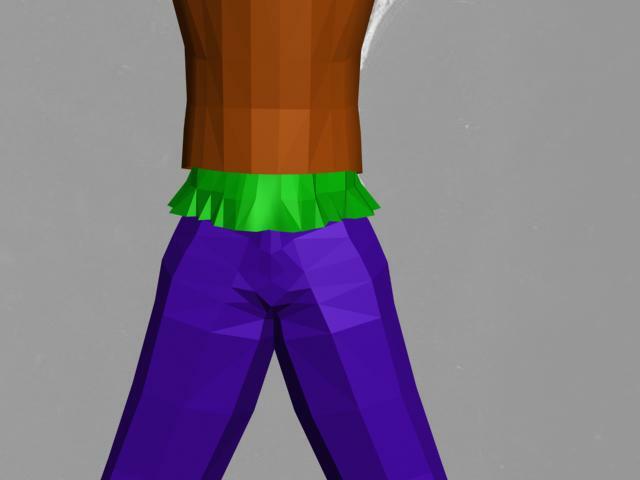 What might take a while later is to acctually be able to make good hair, since we have only before learned to set up really low polygon hair, and I have decided to try and make belivable hair for this one. 5. I started on trying to make the part of the shirt that stands out under, I made it the same way I made the vest, just that I tried to make it have some clothes form to it. 6. 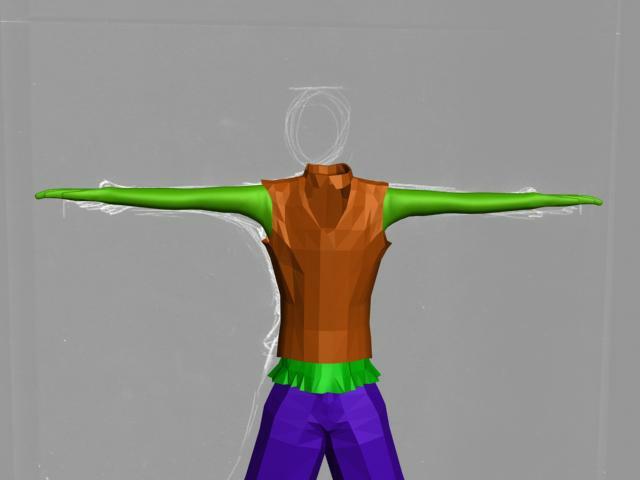 When I made the hands I started with fitting them into the vest, so you won’t see that they are not connected to any body if you watch from the side. They became a little chubby at some places, and I might not have made the joints right, but that can be arranged later. After I were done with one hand, I mirrored the other and put it on the other side of the body to make some less work. And thus I were done with the body, and have now started on the head! 7. When making the head you start out in a new scene, and build it just like with the body, just that you only need two pictures, one of the side and one from the front. Then you make a box that covers the face both in front and from the side, before you cut away half of it, and mirror the box. this way you don’t have to do everything two times and use much time to get the head to look alike from both sides. (Even thou the human head isn’t symetrical) Then you build up the form of the head, so it ready to be molded into the face you want. 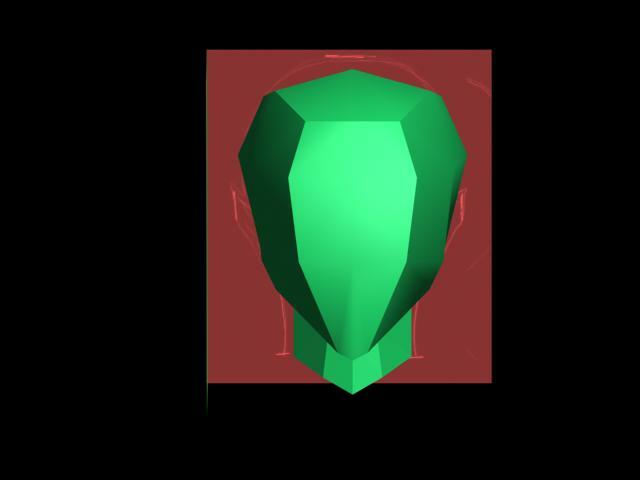 I will soon be done with the head if I work fast, so I can try and show the figure for the second presentation in May. But I don’t think I will be able to make the skeleton for the body before we are going to deliver the task. 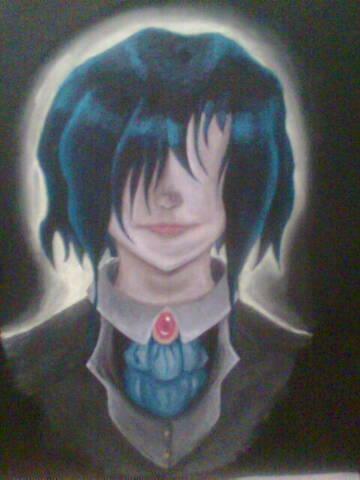 But I will also use a lot of time to make more pictures, maybe try to draw the town of the faceless ones, and also I will have to draw a paiting of Cain, as he is as important to the story as Cian. I haven’t posted much in a while, but that is because I have had much to do lately, and haven’t had the time to post the things I have done. I am almost done with the painting, I only have some coloring of the face left, and I seem to have some problems placing the eye. When it comes to the colors everything went perfect, but I used some time to try to decide the hair color. I thought about having it white or a king of grey, but that would make the hair fade against the skin and the light from behind. Then I went trough the possibilites, black would be wrong, since it would be too much black in the picture, but then I decided to go for black with a shade of blue, to make it look a little shiny. The skin color was a problem from the first brush stroke, since I wanted to have it really pale, but the shadows got a little pulled out, and before I knew it I had too dark skin on him, I am still working on making it paler, and to get down the strong color on the mouth and the nose. The last things I have to fix before adding the eye is to close the hair around the eye a little, since it seems one part of the hair is pulled too long up towards the top, making him look really long in the face. 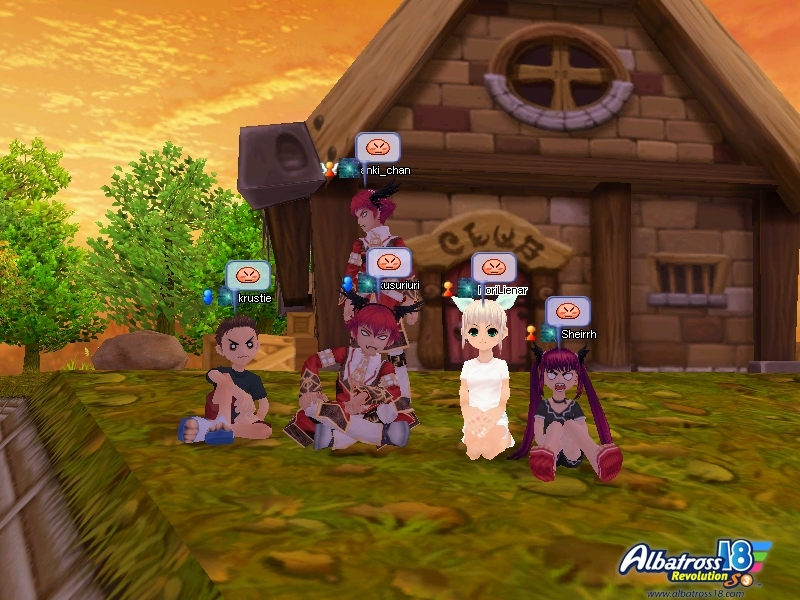 I am now the official Guild leader of a fantastic group named ‘the baka brigade’ on Pangya (Albatross18).